The DH Offloading Post-Op Shoe is the perfect solution for effective offloading of diabetic foot ulcers and other plantar wound conditions. It provides optimal offloading utilizing our patented post-op shoe and active offloading insole. This shoe can be an excellent alternative to post-op style shoes with static pads (wool, felt, foam, etc.). It accommodates the ambulatory and compliant patient for short-term treatment (1 to 4 months). Optimal offloading utilizing our patented active offloading insole. Reduces shear forces and eliminates peak pressure points. Independent Shock Absorbing Hex-Plugs are easily removed from the area of the wound. Edges can be trimmed for a more precise fit. Patented removable toe piece aides in wound accessibility for daily wound site inspection. Designed to accommodate bulky dressings. Designed to accommodate either the left or the right foot. Supported post-op shoe with semi-rigid rocker bottom outsole. Soothing. Easy To Use. Lightweight. Safe. Sturdy. Ordered a pair for my mom. purchased a pair for my mother and she is loving them. I wish I could buy inserts. Shoes are like new but inserts are wore out. Soothing. Easy To Use. Healing. Decent offloading shoe at good price. Decent offloading shoe for those wanting to reliever pressure off of an ulcer. It is roomy to accommodate bandaging but it is difficult for walking long distance. 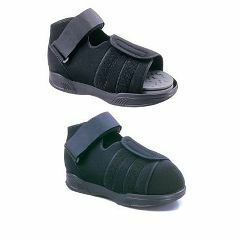 It's as though as its made for more light wear (like around the house, short trips out and about), lack of support about the ankle and forefoot makes it less sturdy and stable and shoe will shift when walking but overall, its not bad for the price and purpose of the shoe. Soothing. Easy To Use. Healing. Easy Storage. Lightweight. Safe. I wore one out. Is this good to use as a post op shoe too? My husband has a lot of swelling in his feet. If I order the X-Large and once it gets here it will not fit...can the boot be returned? Can you sell me replacement indoles for my offload shoes. Need 12357insoles. They would probably be covered if her doctor would write an order or prescription for them. I believe they are cheaper on Allegromedical.com. That is where I get my daughter's shoes.